Nine-year-old Faith Russell was born with the worst form of spina bifida. She endured three surgeries within her first year and then amazed her doctors by learning to walk at 21 months, even though she has no feeling in her feet. When Faith was 4, her older brother Griffin was moved by news reports from the 2010 earthquake in Haiti. He began asking his parents to adopt a child from Haiti so there would be “one less without a house or a family.” His parents, Greg and Robin, explained that they couldn’t just go to Haiti and bring a boy or girl home, but for Griffin’s sake, Robin began looking for a way they could help a child in Haiti. That’s when she found Operation Christmas Child. Griffin’s heart was comforted as he packed that first shoebox, hoping it would bring joy to a child in Haiti. 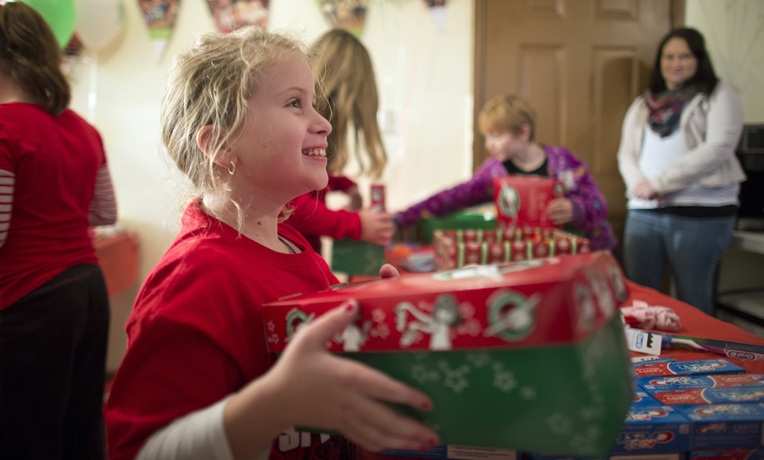 Faith joined her brother in the effort and she celebrated her eighth birthday by holding a shoebox packing party. She set a goal of 50 boxes and shared it with her church, Oakland Baptist Church in Maryville, Tennessee. The congregation of 100 packed gifts for 150 children! Along this theme, Greg and Robin decided that God was using their children to prompt them to adopt a child. So for her ninth birthday, Faith asked to sponsor her own 5K in order to raise money for an adoption. She also asked every participant to bring items for Operation Christmas Child shoeboxes. This past year, Faith encouraged her church to double their shoebox goal, and they packed enough for 300 children. Check out more from Samaritan’s Purse here.